Camrose AB – The 13th Annual Growing Rural Tourism took place in the City of Camrose on April 8, 9 and 10. With over 200 delegates on record, the conference was titled “13 REASONS WHY”. At the onset of the conference, delegates were encouraged to network, meet new contacts and make new friends. This was to be the flavor of the entire conference. Assisted by some dynamic volunteers from the host city, the conference chair was Jennifer Filip, a pixie dynamo who had this event strongly under control. From her positive words welcoming delegates in the colorful conference agenda booklet (that she co-created) to her actions on and off the stage, she displayed what rural tourism is all about: dedication, dynamic energy, clever organisation and friendliness. Ms. Filip, a busy Events Coordinator with the CRE, the Camrose Regional Exhibition, shared that the “13 Reasons Why” had to do with the 13th anniversary, being located near Hwy 13, and… being that this was also… 2013. The conference was born in the City of Camrose, and is a project under the umbrella of the CRE. On a side note, sincere thanks go to Murray Greer, Director of Alberta Agriculture’s Grants Program, for offering some interesting numbers to this report. Alberta’s rural community can be proud of its 65,000 volunteers who each year, help out the 294 Ag Societies and Major Fairs & Exhibitions throughout the province. The Alberta Association of Ag (agricultural) Societies was well represented by congenial Tim Carson and Lisa Hardy at the conference; they proudly showcased the comprehensive and well-designed 2013 Directory of AB Ag Societies, a valuable reference manual to take home. There were countless worthy presentations and valuable speakers. The following are just a few of the interesting sessions that delegates could take in, empowering them with fresh knowledge and marketing tips they could bring back to their communities. We take the liberty here to quote the conference promotional brochure, in regards to sessions that were not attended. The 1st presentation was “Creating your Facebook Display Advertising Campaign” by Trevor Tessier. Let’s face it: most dynamic communities have a presence on Facebook, adding news, milestones and photographs on a regular basis, and when this is well done, it creates a dynamic advantage, for communities and special events! Following this, the Culinary Tourism: Building a Competitive Advantage” session with members of the Alberta Culinary Tourism Alliance, dwelled on how a wonderful culinary experience will add to an overall enjoyable visit, and more critically, “culinary tourism” on a broader spectrum can and will add an advantage to any tourism strategy! “Listening between the Lines”, in which he boldly stated that WORLD-CLASS LEADERS are the ones who truly listen, proving that effective communication skills can lift marketing success (tourism) to new levels. “Youth engagement” was a critical topic presented by Steven Kwasny of Volunteer Alberta. The global volunteer community recognizes that “youth is the future” so engaging youth in community events (planning and executing) is a sure way to engage them for the future, and also engaging their families’ support. The importance of “Succession Planning” was recognised in this interesting session hosted by Shauna Feth, executive director of Alberta Business Family Institute, with the University of Alberta’s School of Business. Succession planning is important to the survival and vision of Canadian businesses, an element that should be positive and empowering. Of course, the topic of “who to leave the family farm or rural business to” is a critical element of planning for any type of rural (and urban!) business! “Can small towns be cool?” by David Ivan, opened the mind to finding new opportunities for smaller communities to promote themselves as an ideal place to work, live –and visit! “Downtown Revitalization” was a critical topic, as many small towns in Alberta deal with the same challenges, in the face of nearby box stores and other commercial developments. A vibrant downtown is a vital element of a small town’s growth and economic wellbeing. ”Birthday Town Alberta” was presented by Brian and Leesa of Smoky Lake Inn, where birthdays are celebrated all year long, for residents and visitors from far and wide: a successful formula for a fun destination! “Festival & Event Tourism Growth Program” was presented by articulate and dynamic Corinne McGirr, of the Lloydminster Exhibition Association, an über-successful organisation. Tuesday April the 9th offered conference participants a full schedule, starting with the keynote speaker, Jogn Schaller, CEO of the US-based Shallert Group that teaches business owners to “Be Small, but Play Large”. Mr Shallert followed that presentation with a further exposé on “How to attract your most profitable customers as a destination business” EQ: do you know what that stands for, was the challenging question: the answer is… The Explorer Quotient, energetically described by Marty Elberth of Travel Alberta, is what will help you find and retain new customers, enabling communities to make the most of the visitor experience. Jessica Harcome-Fleming of Travel Alberta articulately explained how media exposure and friendly media relations are valuable assets to any community and event. Alberta Talent, a great Tourism asset. Young composer, guitar virtuoso and talented singer JOAL KAMPS is promoting his latest album of soft and memorable bluesy folk songs (this writer loves the tunes ‘Learning to pray’ and …’Old Soul’), and also had a booth in the Conference Tradeshow. What a pleasure to hear him! LEDUC #1 ENERGY DISCOVERY CENTRE was the proud recipient of the Alberta Rural Tourism Award, recognized for its vision, its successful marketing strategies and recent accomplishments. 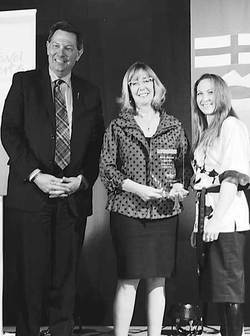 Lynn Brown, the centre’s marketing guru, was proud to accept the glass trophy from Tourism Minister Richard Starke and conference chair Jenifer Filip. It is a huge honor to be considered for this award is also special, as felt by the other 2 contenders, the Belles of the Badlands, who have successfully initiated tours of Alberta’s Badlands, and Woodlands County Alberta Community Icon Passport Program, a successful marketing strategy that has been a very positive element of that region’s Rural Tourism mission. The Town of Bashaw was the thrilled recipient of Small Town Saturday Night, a country music concert and a Big Valley Jamboree off-shoot. Thanks to an excellent video that involved music and local residents in a creative montage, as well as a $5,000 cheque to be offered to a charity of their choice. A fantastic TRADE-SHOW stood proudly in a separate banquet room (actually used as the dessert room) with several exhibitors showcasing their region in colorful literature, gadgets and large posters. Leduc #1, the City of Wetaskiwin promoting its corporate strategy, its destinations and its walking tours, BIG, the Wood Buffalo region’s Concept (Big, Bold, Growth- Fort McMurray), a guidebook for effective meetings by the governments of Alberta and Canada, the Travel Special Areas’ smart marketing and the other exhibitors built together a smart and informative trade-show. All in all, much was learned, shared and discovered at this 13th Annual Rural Tourism Conference. Isn’t this what Rural Tourism, growth and leadership are all about?